Recently, Consumer Reports demonstrated again how they're completely in the deep weeds whenever they review computers and, more specifically, operating systems and applications. But, unlike the computer writers at CR, you can protect yourself from phishing scams and still use Safari (or any other browser). 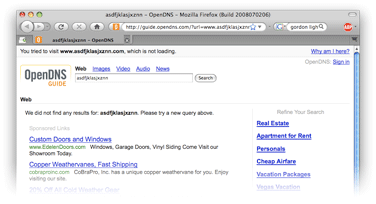 Consumer Reports touted Firefox or Opera over Safari because of the built-in anti-phishing tools in those first two browser; Safari has no such built-in capability. There is, however, a free service you can use that will give every browser on your Mac a full set of anti-phishing tools (and additional tools, if you choose to use them). This service is called OpenDNS, and it’s a free replacement for your Internet service provider’s (ISP) domain name servers. As a bonus, your connections will likely resolve faster than they do using your default DNS servers. And, of course, this is not a Mac-specific solution. It should work on any device that lets you set the DNS servers to be used.